The French ski resort of Méribel draws people from across the globe keen to experience the resort’s spectacular slopes, lively nightlife, charm and character for themselves. But aside from the pristine pistes and varied après-ski on offer, there’s another major reason to pay the resort a visit; the food. Méribel is a mega-resort with a reputation for luxury, so you’d be forgiven for thinking dining options were restricted to expensive restaurants and Michelin-level fine dining, but this is simply not the case. Visitors to the resort can find everything from basic baguettes, burgers and pizzas all the way up to exquisite haute cuisine in five star surroundings. In short, there are eateries and restaurants to suit all budgets and tastes. At the lower end of the dining spectrum, Méribel offers a wealth of sandwicheries and burger bars perfect for picking up an inexpensive lunch in advance or taking the kids for a cheap treat. With baguettes freshly made each day and fresh produce throughout, these inexpensive eateries are the perfect option for the price-conscious. Venues such as the ever popular Jack’s Bar plus other centrally located options like la Taverne and Scotty’s all offer broad menus of filling burgers, pizzas and the like and the value for money is good. Over in Méribel Village, the Lodge du Villagebar and restaurant has been a favourite for years and with good reason. Other cheap eats like hot dogs, wraps and nachos are also popular options for seasonnaires, parents and kids alike. Méribel’s superb mid-range restaurants are notable for those ever popular Savoyarde specialities so many skiers know and love. Fondues, raclettes, hot stone pierrades and tartiflettes feature heavily and make for a wonderful change from the norm, though international cuisine is also popular. For a good quality meal out which won’t break the bank, Méribel offers myriad options. Highlights include Chez Kiki andAux Petits Onions up the hill in Mottaret, plus le Refuge and la Galette in the heart of town centre. These traditional and characterful French restaurants may enjoy a certain mark up on their meals, but the food is superb and you’ll leave feeling full so the value for money is pretty decent overall. With stories of seafood being flown in directly to slope-side restaurants in time for the luncheon rush and cellars full of the finest vintage wines, the top-end restaurants in the Alps take their service very seriously and Meribel is no exception. The resort has a long history of haute cuisine and boasts some of the finest restaurants of any resort in Europe. For discerning diners looking for something truly special Meribel offers a few highlights, both on and off the mountain. 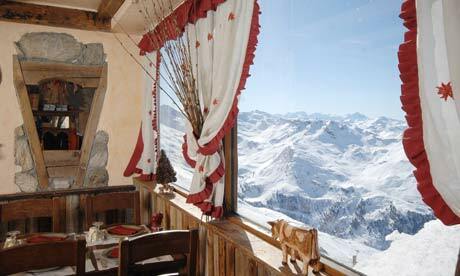 Up on the slopes, establishments such as les Allodis offer the ideal location for a terrace lunch in the sun. Les Allodis sits opposite the mid-station of the Rhodos cable car with spectacular views and a menu to dine for. Other highlights include theGrand Coeur in town centre, a traditional restaurant with tip top service and superb food, and le Blanchot up near the Altiport, which is undoubtedly one of the very finest restaurants in the Meribel valley.